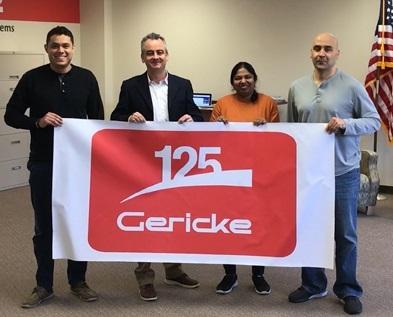 Process equipment manufacturer Gericke is celebrating its 125th anniversary as a pioneer in the development of powder processing systems and equipment. Founded by Walter H. Gericke in 1894 in Zurich, Switzerland, to meet growing demand for automated bulk handling systems in four mills, Gericke pioneered a series of engineering advances in pneumatic conveying, feeding, milling, mixing, blending, weighing, and other processes, earning patents and customer acclaim while driving expansion worldwide. Now headed by fourth generation managing director and CEO Markus H. Gericke, the company offers a complete range of state-of-the-art equipment and expert engineering services for the automated handling of dry, bulk materials from the railcar, silo or bulk bag through to the processing and filling lines. The company's 21st century innovations include the EasyDos Pro control system for accurate feeding and weighing; continuous manufacturing modules for improved pharmaceutical tableting; the GMS Multiflux batch mixer for maximum homogeneity, and the Pulse-Flow) PTA dense phase pneumatic conveying system, among several others. Serving a global customer base that includes a who's who of the world's most respected organizations, Gericke today operates nine facilities in Europe, Asia, South America, and North America encompassing, design engineering, manufacturing, testing, sales and technical services.